the emergency flashers can be used. The multi-information display will not be displayed. some electrical components such as the power outlet can be used. �Accessory� will be displayed on the multi-information display. 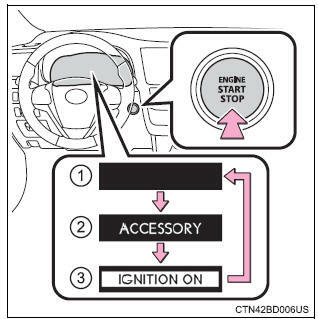 �Ignition on� will be displayed on the multi-information display. *: If the shift lever is in a position other than p when turning off the engine, the engine switch will be turned to accessory mode, not to off.